Wester Ross is synonym for remote, lonely, beautiful and wild. It’s an area of outstanding natural beauty situated between Loch Carron in the south, Loch Broom and Ullapool in the north and Achnasheen in the east. Wester Ross is unspoilt and there are areas where visitors are seldom seen such as the Letterewe Estate north of Loch Maree. 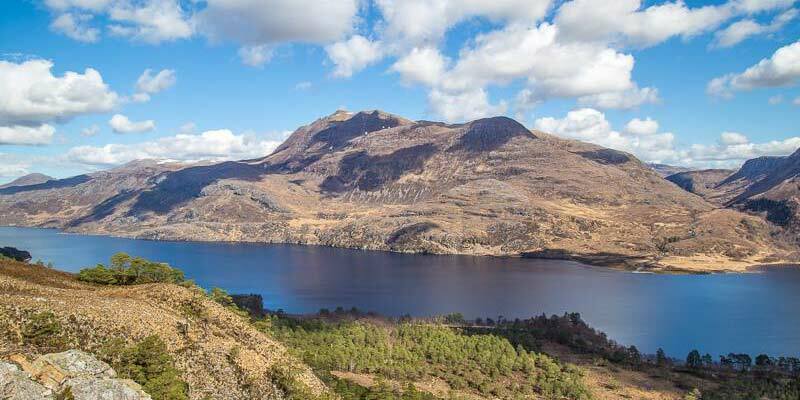 Well known and beautiful lochs are loch Torridon, with Liathach in the heart of the huge Torridon mountain range, loch Maree with the Slioch and Beinn Eighe mountain ranges and dozens of other remote lochs in just as many beautiful glens. Wester Ross is also one of the few parts of Scotland which still has (remains of) the old Caledonian forest. There are a little over 6,000 people living in Wester Ross spread over eight or so larger villages, a small town, and many smaller settlements and farms. 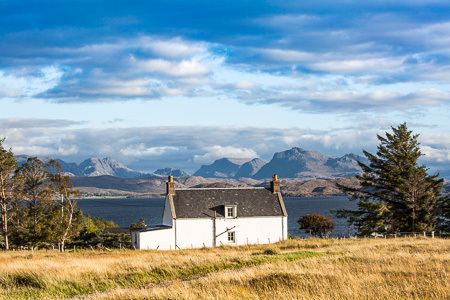 The fact that Wester Ross is largely uninhabited makes it an attractive holiday destination. This part of Scotland, and further north for that matter, offers almost deserted roads where you can sometimes drive for almost an hour without even passing a large village and seeing only few people, especially outside the tourist season. The best way to discover this stunning area is by car or by foot. The distances for cycling are quite long unless you are experienced. Driving around in Wester Ross is an adventure on its own. With its many single track roads, huge mountains and breathtaking scenery, Wester Ross provides a picture of Scotland in optima forma. Walking might challenge the adventurer in you but be careful when entering the remote parts of Wester Ross. A compass, maps and good equipment are essential since the weather can change rapidly and dramatically. If you come well prepared you will find the area to be a hill walkers paradise. Loch Maree is 20 kilometres long, lies in the heart of Wester Ross, and is definitely one of the most beautiful lochs in Scotland, both from a touristic but also from a historic and wildlife point of view. Loch Maree is the fourth largest fresh water loch in Scotland. 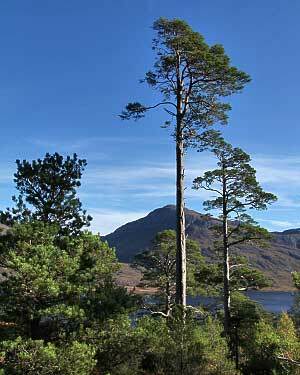 Loch Maree contains five large wooded islands and over 25 smaller ones, many of which have their own lakelets. Just outside Kinlochewe on the main road is the Beinn Eighe Nature Reserve. It has a visitor centre and two very well maintained trails, a woodland trail and a mountain trail. Both walks pass through the remains of the great Caledonian pine forest. The Scots Pines are of an outstanding beauty. They are very compact Bonsai-like trees and a walk through this forest is an unforgettable experience. The highest mountain of the Beinn Eighe range is 1009 meters. The views from the top of the mountain trail over Loch Maree and Wester Ross are absolutely stunning and unforgettable. Ullapool is a lovely town with a beautiful and sometimes bustling harbour with Calmac Ferry Terminal where you can board the ferry to Stornoway in the Outer Isles. Here you’ll find many restaurants and shops and there is nothing better than to make a stroll on Shore Street on a sunny day and watch the fishermen land their catch or just to sit and watch the world go by. Ullapool has a very interesting museum annex visitor centre in an old Telford church, good shopping facilities and is very much worth visiting. Dotted around Loch Ewe are several interesting villages such as Poolewe, Cove, Inverasdale, Aultbea and Mellon Charles, all situated on the shore of loch Ewe which is the only north facing loch of Wester Ross. Loch Ewe had a military role during WW2. Poolewe is a very lovely village with its own market every tuesday morning, the market in Aultbea is usually on Fridays in the tourist season. There are several hotels, in Poolewe and Aultbea, which serve good dinners as well as a few other restaurants. Poolewe is located on the east-side of loch Ewe where the river from loch Maree (only 2 miles away) flows into the loch. With Inverewe Gardens only 500 meters away, Poolewe is a very nice place for a holiday. The b8057 takes you from Poolewe to Cove passing Inverasdale, Naast and Midtown. Cove is where the road ends and at Rubha nan Sasan you can find a war memorial to the crews lost on Russian Convoys. Loch Ewe was used in WWII for naval vessels to assemble before sailing the oceans in convoys. The remains of the gun-emplacements can still be seen, as well as on the other side near Mellon Charles. Gairloch is a friendly little place situated on the north side of Loch Gairloch. The village is popular amongst tourists and there are several restaurants and pubs, shops and also boat trips are available from the wee fishing port. A trip very much worth while is to the remote lighthouse of Rubha Reidh. This is a trip not for the faint hearted, the road is spectacular and the views towards the Isle of Skye even more. The reward however at the end of the trip is fantastic. On a clear day there are views towards the Outer Hebrides and the Isle of Sky. Drive from Kinlochewe towards Torridon and you enter a different world compared to the area around Loch Maree. You are now south of the impressive Beinn Eighe mountain range. At the end of this beautiful glen is Upper Loch Torridon and the village of Torridon. The minor road continous west to Inveralligin and Diabaig. There are six stunning miles between Torridon and Shieldaig and it’s hard to stay focussed on the road with so much beautiful scenery around you. There are a few places though where you can park and take in the beautiful mountain scenery. The village of Shieldaig can be found off the main road in a beautifully sheltered bay called Loch Shieldaig with views to Shieldaig island and its beautiful Scots Pines. Shieldaig is a pretty wee village which comes highly recommended for a visit. Just outside Shieldaig is a single track road heading west to Applecross and a few other small villages, the Applecross Peninsula is one of the most remote places in Scotland. If you follow the main road (A896) from Shieldaig you end up at the head of Loch Kishorn where you have two choices, go right over the Bealach na Ba, the beautiful pass, to Applecross or continue on the same road to Lochcarron. The Torridon Mountain range acts as stunning backdrop to the village of Applecross which is perhaps most famous by the spectacular road that leads over the mountain pass. 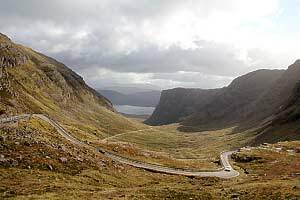 The road is called Bealach na Ba which is Gaelic for Pass of the Cattle and starts at Tornapress where you can find a sign with the following text: “Road to Applecross (bealach na bá). This road rises to a height of 2053 ft. with gradients of 1 in 5 and hairpin bends. Not advised for learner drivers very large vehicles or caravans after first mile.” All the more reason to make this trip and enjoy the stunning scenery! The return trip via the coastal route to Shieldaig is highly recommended.